In August 2006, the American Bar Association issued a big document titled Standards for the Provision of Civil Legal Aid [1.5 MB PDF]. The new Standards are a full replacement for an older standards document first adopted in 1986. One of the significant revisions is a major overhaul of the section on public legal education and information. Although the standards and their commentary are tailored for civil legal aid providers in the U.S., they could be directly applied to Canadian PLE efforts. Accessible materials: providers should “make certain that legal information materials can be understood by the intended users” and “should also be sensitive to culture mores of the various low income populations” that they serve. The full commentary to this standard (Standard 3.6 “on the provision of legal information”) has a whole bunch of other relevant material, including much more on provider responsibilities, a section on legal advice versus legal information versus legal education, a collection of rationales for PLE, and a discussion on when PLE is appropriate in light of unmet need for direct representation. Plus, other standards include 2.4 (“Cultural Competence”), 3.5 (“Assistance to Pro Se Litigants”), and 4.6 (“Communication in the Primary Languages of Persons Served”). Should Canadian PLE providers, perhaps through PLEAC or perhaps in coordination with other access to justice players in Canada, develop a set of standards for PLE in this country? If so, what would be different from the ABA’s standards? What could be added? “Plain language”—communicating in ways that your audience will understand easily—has been part of the bedrock of Canadian public legal education since the beginning. 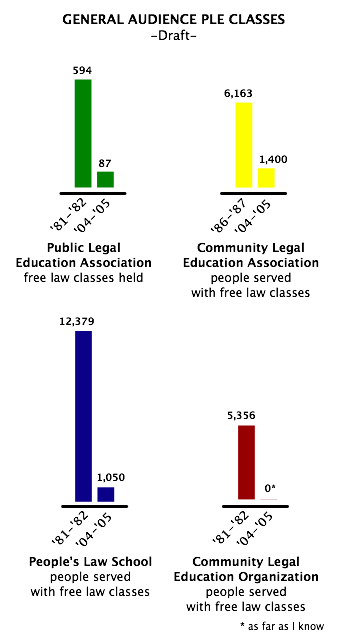 Although PLE providers have deployed plain language techniques mainly in text, most commonly in pamphlets and booklets, plain language ideas have infected so many aspects of PLE work that it’s often hard to imagine the plain language strategy as something technically separate from public legal education. Éducaloi recently let me know that it will be presenting a workshop on plain language at the annual meeting of the Barreau du Québec. This workshop’s goal will be to encourage debate on the role of plain language in Québec’s legal profession. Inspired by this announcement, I thought I would use this blog to encourage an assessment of the use of plain language in Canadian PLE and a debate on what could be different. Canadian PLE providers have been involved in two strands of “plain language.” One is the movement to require that legislation, instruments of law, and government communications be written in plain language. This is an international movement, and a successful one in some places, like Sweden and the State of Washington. Canadian PLE providers once played a noticeable role in Canadian arm of this movement, but their involvement has tailed off. PLE providers have stuck much more closely to the strand of “plain language” that’s about communicating in easy-to-understand, audience-targeted ways. Ever since the earliest, late-1960s law student clinic efforts at educating the Canadian public about law, PLE people have been using plain language techniques—whether consciously or unconsciously, formally or informally. Sophistication in this area has increased remarkably over the years, and today many sole-purpose PLE providers use plain language handbooks, provide plain language training for staff, and, in some cases, employ full-time plain language editors. As for where the help provided in phone/email legal info and referral hotlines would go in that ranking, I’m really not sure. If this “ranking” picture is roughly accurate, is this the way plain language should should look in PLE? Is document and graphic design paid too little attention, as apparently often happens in other fields? Could there be more infusion of plain language techniques into “live” PLE events, like workshops? Should speakers bureau volunteers receive more training in plain language strategies? And what about the plain language in legislation and government communications movement? Why did Canadian PLE providers move away from it? Wouldn’t pressuring government to improve its own communications methods make PLE’s job easier, and generally improve Canadians’ understanding of law and government?